Some days, when you take the trouble to pause and enjoy what you have, you capture the best scenes, both in your mind and on camera. Insta-Updates is a snapshot of life I post to my blog, extracted from my timeline at Instagram. Look for me at PARISBMWS. I cannot promise a surfeit of beauty products but I promise to see beauty in everything. PREVIOUS POST: New! RMK Celebrates their 15th Anniversary with the most gorgeous cheek palette ever! Sunsets are nature’s reward for a job well done today! 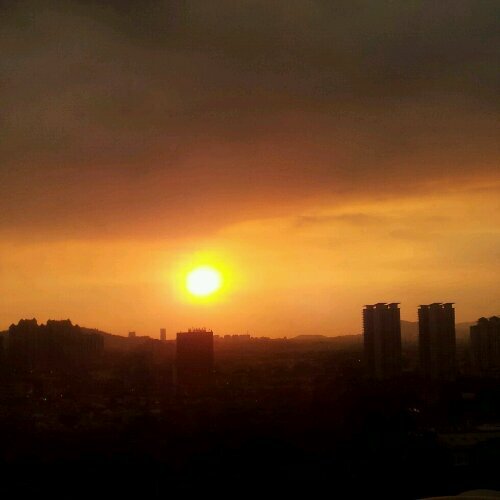 It’s so easy to see such sunsets and sunrise in Malaysia. I could see this kind of unblocked view from the condo I was staying in that time too. And I was only on 7th floor up from flat ground. Can never get this in Singapore unless one is ultra ultra rich. Even the ultra rich can’t buy this view. Yeah, the density of the population in Singapore boggles my mind everytime I go. Its the same with Hong Kong. I guess I’m just not used to such crowds. I find it very tiring LOL! What a beautiful shot Paris! I am very fond of sunset and sunrise. Sometimes the sunset view from KLCC is so pretty, like a huge cosmetic palette.